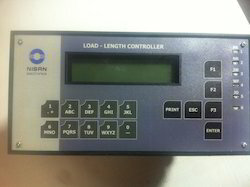 Leading Manufacturer of load & length controllers and load indicator from Pune. We are offering our esteemed clients a wide range of Load & Length Controllers for industries, which is precision engineered to match the international quality standards and industry norms. We have dependable strived to offer the best Length controllers to our esteemed customers. The whole scope of our items is made after appropriate guidelines of value utilizing predominant quality segments. The controller can be utilized with linear potentiometer to give required length show. Besides the working range, our product is also providing very sensitive safety specifications in use point of view.